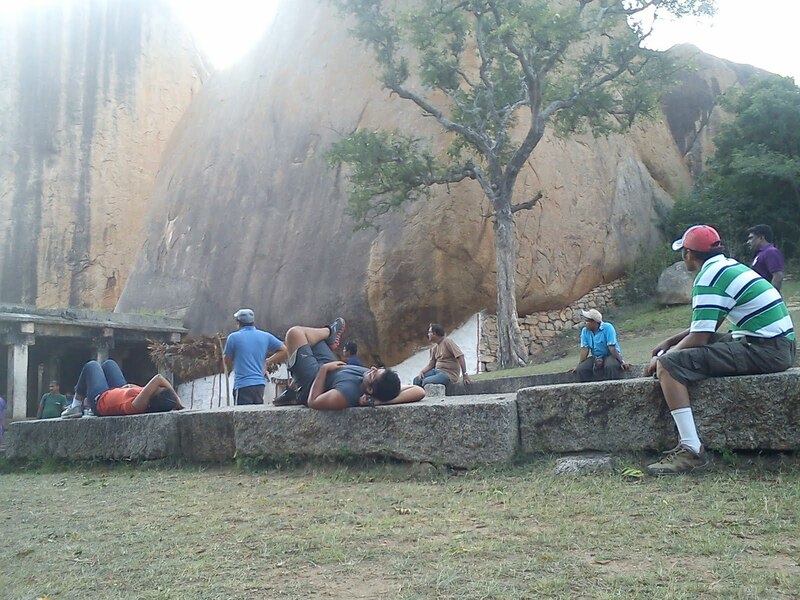 During the warm-up to rock climbing, a new word entered our lexicon – “Ji-goo-ja”. Brainchild of our instructor Prabhu, we swayed to its every syllable and laughed our lungs out in the process! The short trek to the rock - that would be our object to scale for the day - proved to be the perfect occasion for cameras and sun glasses to come out. With the Chitradurga fort and the wind mills in the distance, the scenery around us slowly and surely, like a magnet with just about the right attractive powers, drew us into its embrace. Fears – how do we deal with them? Mostly we try to circumvent them or carefully postpone their onset by trying our best to avoid them as far as possible. There are exceptions though. Sometimes, more than our own belief in our capabilities, we might just discover that others around us may believe strongly. That is the most opportune moment to confront our fears and emerge on top. In other words, when “I can do this” becomes a little tough, “you can do it”, heard a 100 times magnified, repeated over and over again, might just work. Rock climbing, to the majority of us, had a similar effect. In a group that had come together with the sole objective of indulging in adventure, this encouragement, which constantly floated in the air, subtly aided in bonding. 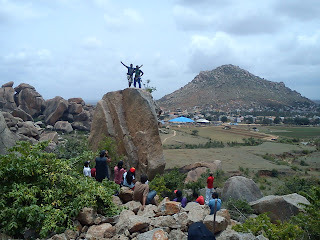 The bravehearted and the supremely confident among us took to rock climbing like fish to water (Niles bhai for example), while for the rest (the category of the lesser mortals), it took time to build that confidence thanks to the “You can do it” shouts in large measure. Raghav, when he made the climb, stood out with his attitude. He writes in his blog space – “I have a hunger to do everything whichever is possible in this life including a space travel. I love good food, theater plays, music, adventure sports and all that where I can live the life to the fullest.” His attitude towards life is highly inspiring. He has not let his vision impair his dreams in any manner – indeed, positive attitude and optimism should have Raghav as synonym! I was among the last ones to climb – to get a grip just before the summit, one had to back oneself and give one final heave – the best part of the 3 minute exercise was that single moment! Even the best experiences crystallize into some intense moments – it was such a moment. After rock climbing, instead of heading for lunch, we decided to do some cave exploration. Led by Prabhu and armed with torches, we marched. The first few caves that we entered were all small and relatively easier to navigate. 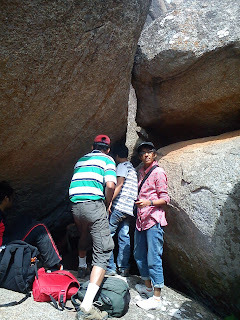 The coolness of the rocks, despite the searing sun right above, kept us going. Soon enough, we were staring at paths that were overbearing in their resolve to hinder our progress. We had to bend, squat, squeeze through, slide, crawl and long jump – through all this, there was a buzz of slight tension in the air. A journey is thrilling when we know not where our next step will take us! This certainly was one such journey. Man has, since time immemorial, tried to outdo nature and every time, fallen short. Be it the construction of dams and zoos or cloning, he has been unable to reconcile to the fact that he is simply not good enough to match up to the creator with the capital C. But, if ever, he came close to emulating His feat, it must be during the reign of kings who encouraged architecture and sculpture. Ankali cave exemplified one such piece of architecture. Undoubtedly, once a lavish abode of royalty, it is now a sad remnant of its glorious past – the Indian penchant to scribble on temple walls extending to caves! With one meticulous piece of architecture leading to the next, Prabhu briefed us patiently on what we saw– down to every minute detail. With enormous effort, we dragged ourselves towards the bus. Alighting at the Chitradurga town, all around us, we found signs of life in a small town – the demurely dressed women and buses and autos moving about leisurely. There was a slow rhythm to life that made me envious of the people of the district. Living life on the less maddening slow lane, people seemed relaxed and so sure of their future – there was optimism in the air. Back at our accommodation, while people waited for their turns to get refreshed, some of us got down to the exciting activity of pitching tents. Me, Sayan and Dada unwrapped one and did a decent job with it – I remembered the evening after I had trekked to the top of Kumara Parvatha peak, an evening truly adventurous! Dinner was spent recounting the events of the day – tiredness that had engulfed all of us hours back had given way to incessant chatter and laughter.